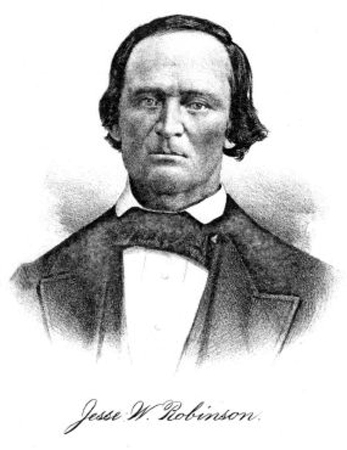 JESSE W. ROBINSON, deceased, was born in Washington County, Indiana, in the year 1820, a son of William Robinson, who was one of the old and respected pioneers of Tippecanoe County. He came to this county with his parents when a boy, and was reared to manhood on his father's frontier farm, and during the winter months he attended the pioneer log cabin schools, where he received a limited education. He was married July 30, 1840, to MISS MARY JANE LUCAS, a daughter of BENJAMIN and MARY (ROGERS) LUCAS, who were also pioneers of Tippecanoe County, the former born in Muskingum, Ohio, in 1794, and the latter a native of Virginia. In 1831 MR. LUCAS left Ohio for this county, and settled in Tippecanoe Township. His wife died in 1868, and after her death he removed to Brookston, White County,. and was subsequently married to MRS. FANNY WILLIS. He died at Indianapolis, October 29, 1874. MR. ROBINSON, our subject, continued to resided on his father's farm for three years after his marriage, when he settled on the place which is yet occupied by his family. He was a successful businessman as well as a worthy citizen, and at the time of his death he owned about 700 acres of Tippecanoe County's best soil. In politics he was a Republican. He was a consistent member of the Methodist Episcopal church, and was highly esteemed by all who knew him. He died January 6, 1872, aged about fifty-two years. He left a widow and thirteen children, and three children had died before him. Eight of the sixteen children born to MR. and MRS. ROBINSON are deceased: REUBEN, HARRIET, MARY, MATILDA, ARVILLA, MARTHA ELLEN, JAMES and CAROLINE, all but the last two reaching maturity. The names of those yet living are: WILLIAM, SALINA, JOHN, JESSE W., IDA D., LUELLA and LUALLA (twins), and GEORGE F. MRS. ROBINSON and her family have a beautiful home, where they are surrounded by all the comforts of life. Lewis Publishing Company, Chicago, 1888.